One of the main considerations for any audiocentric build has traditionally been the overall noise of the final system. If you get to design a studio from the ground up, you find yourself able to rack up or remove the computer hardware into a separate area away from your recording section of the studio. For a lot of users through especially those working in a small project studio environment this may not be viable and you may have to compramises in order to make the overall setup work. In this situation you may still need to have the ability to edit and record in the studio space where your setting up mic’s and instruments so the last thing you want to be able to hear in your final recordings is noise from the computer doing the processing work. Whilst all of our systems are designed with this in mind and components are carefully chosen to ensure as little background noise is created as possible, what if we could go further than that? Ideally we want to be removing as many moving parts from inside a computer as we can to ensure you end up with the lowest noise footprint possible. Enter the 3XS NF26 and the SET-A40 case. NoFan are a new company setup by the original designers from Zalman, who have left to start up a new company developing unique designs and innovating in the world of PC silence. The SET-A40 bundle we base this build around includes a case, cooler and 400w PSU which are all designed to run passively with no fans for required for cooling and allowing use for CPUs rated at upto 95w TDP. So without further ado let’s take a look at it. Well it’s a case box. Indications on it that we should expect 0 db(a) of noise from the system and indications of the components inside. It’s at this stage that you’ll get the first indication of the crazy cooling system from the artwork on the side but more of this later. Unboxed case photo taken from the front. Once we break it out of the box we get to take at look at the front panel. It has a couple of exposed 5.25 bays and a 3.5 for your card readers. The are the normal selection of ports and jacks on the front and all in all, so far, so ordinary. 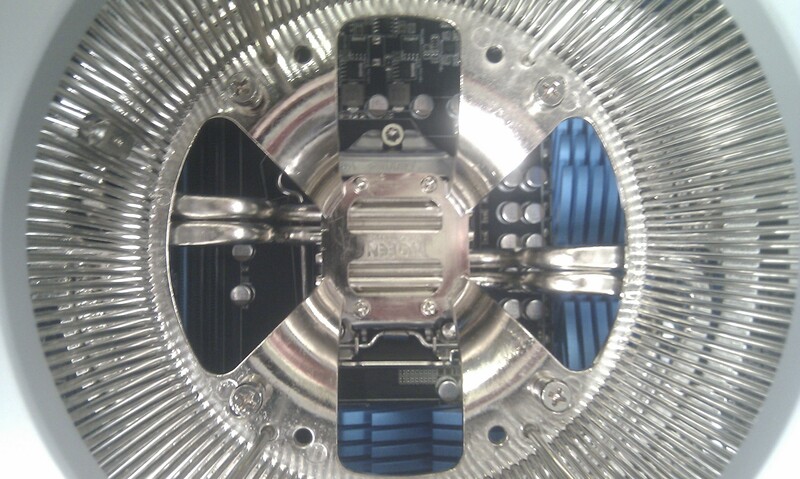 As it says on the tin… the NoFan cooler from the top down. Having opened the box the first thoughts through many peoples minds are pretty much “What is that?!!?!?”. In office we discussed the lot from hamster wheel right through to salad spinner. 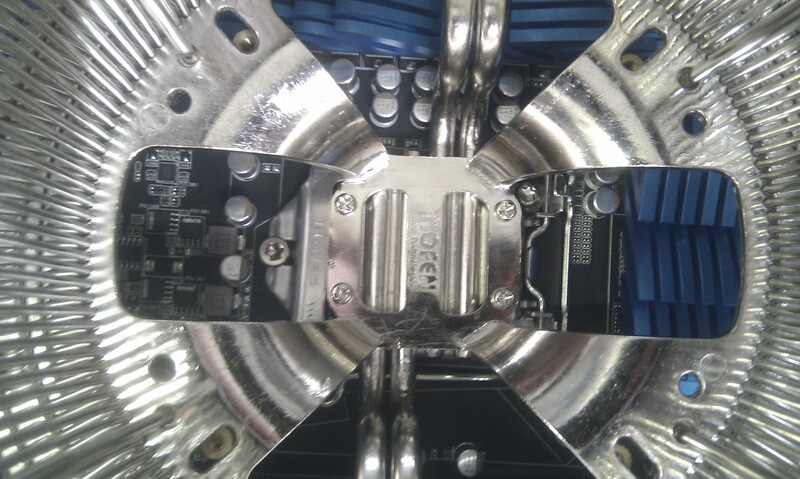 In actual fact this is the very heart of the machine. 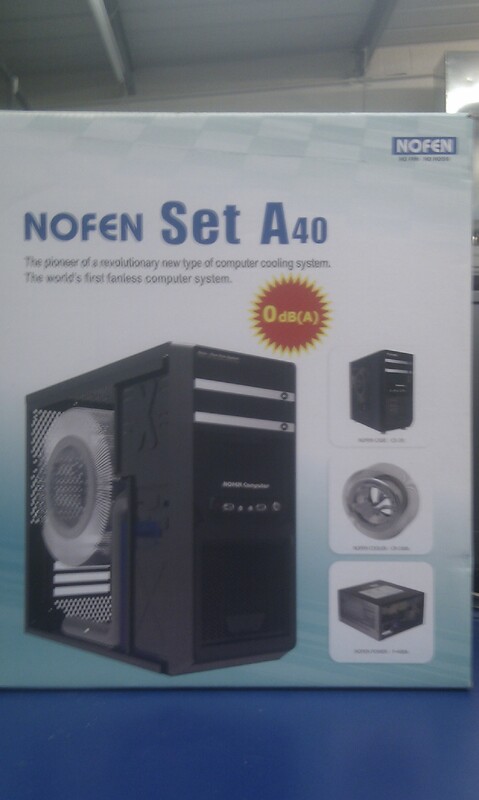 I present to you the NoFan fanless cooler. Based around a liquid pipe design it certainly is sizable but at the same time suprisingly light. 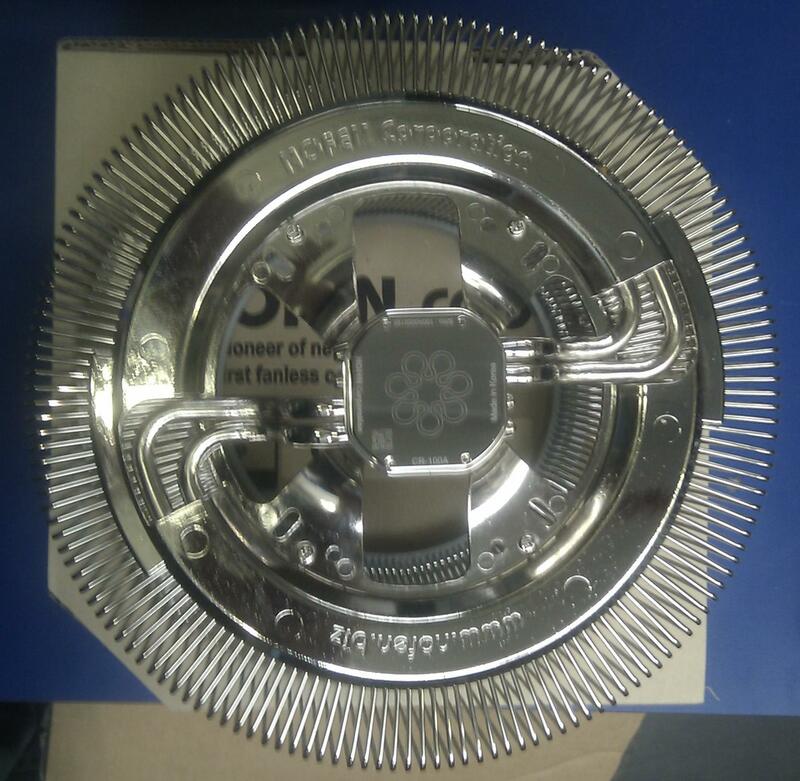 Underneath we can see a nicely polished base with the company logo etched into it with a couple of heatpipes as well as the support arms designed to carry heat away from the heatsink base itself. It’s certainly a nice tidy design and no sharp edges to it which will make builders use to the Zalman flower designs of old breathe a sigh of relief! 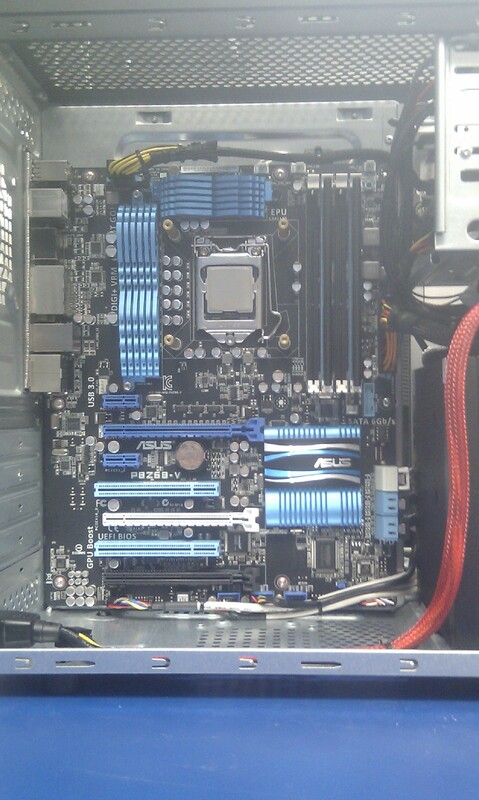 The Asus board set up with the heatsink mounts. 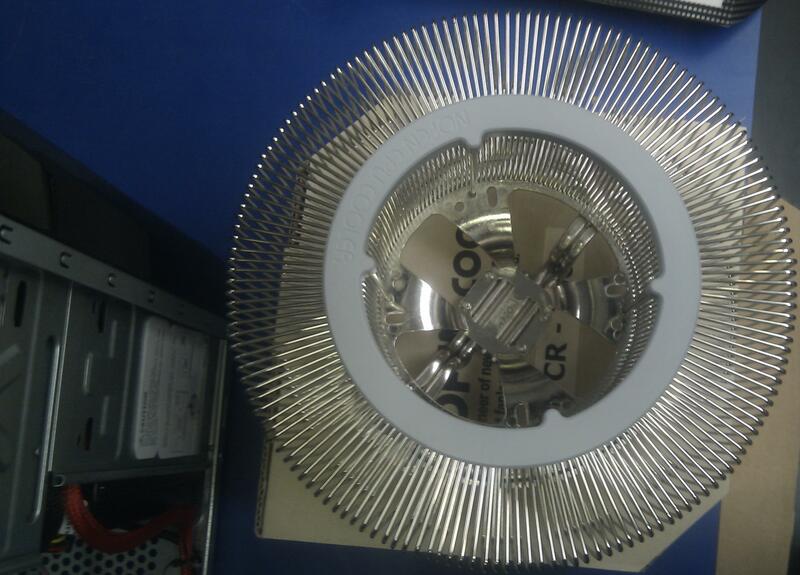 So how does this monster heatsink attach to the motherboard? With surprising ease in fact and it’s clear a lot of thought has gone into this design. 4 mounting poles are attached via screw mounts into a special backplate and that is more or less that which for a heatsink of this size is once again quite surprising. 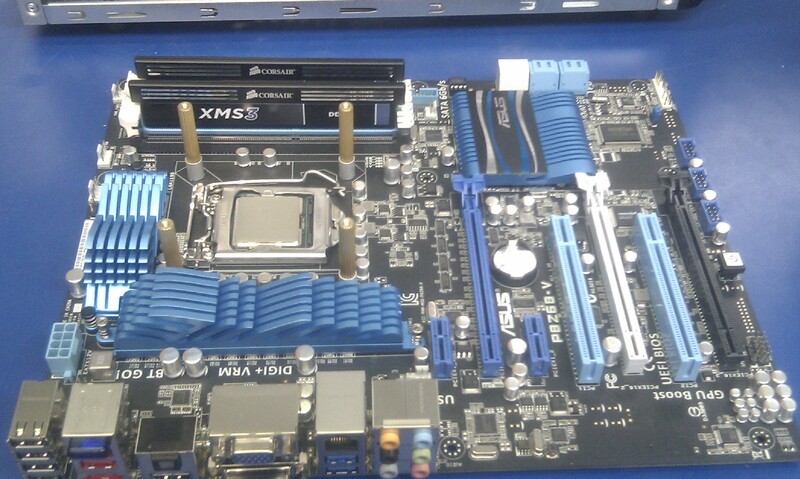 The Motherboard mounted inside the system. 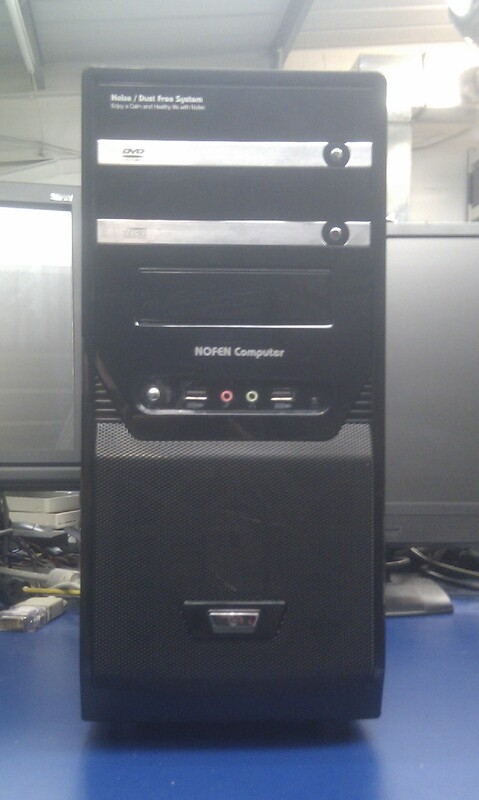 A side on shot of the system with the motherboard mounted inside. 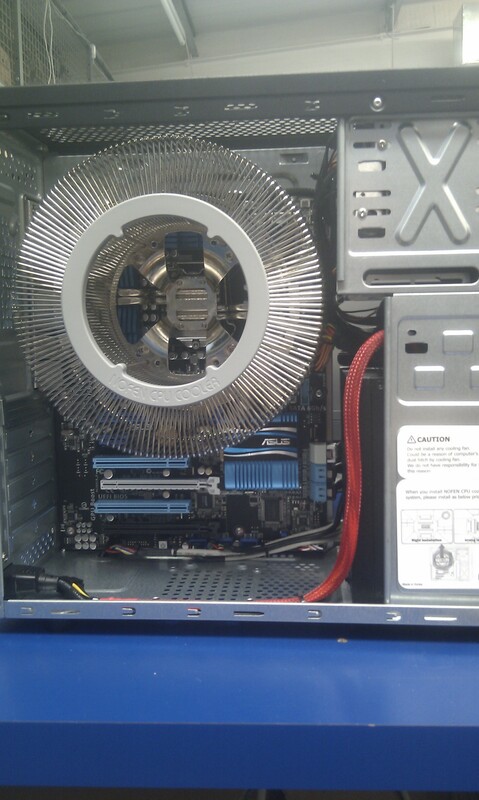 You’ll notice at this point the rather odd mounting position of the psu. As this is also passive and generating heat NoFan have decided to mount it at the front rather than the rear to keep the heat evenly spread throughout the system. 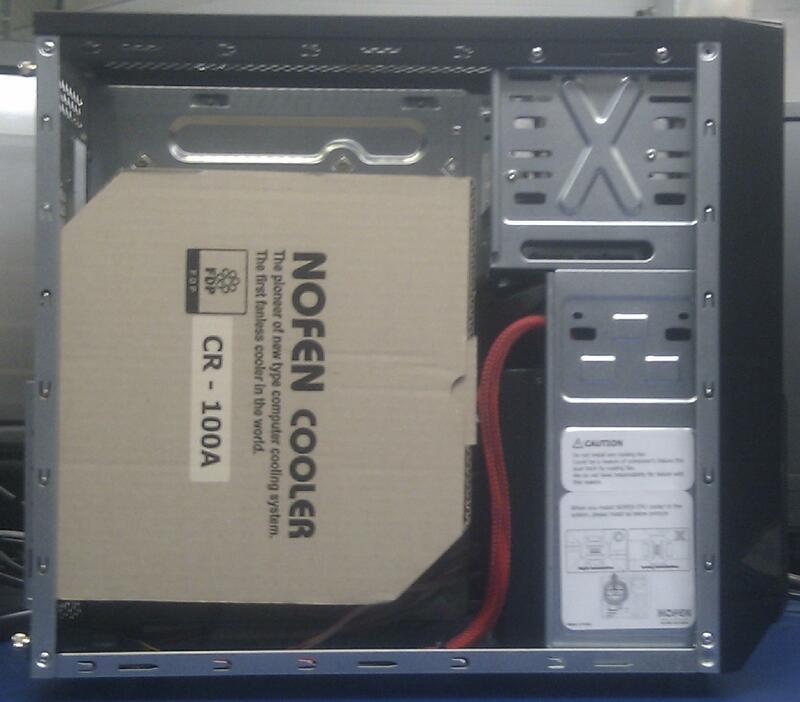 The NoFan heatsink Screwed into the case. Screw in the thumbscrews and the job is pretty much done. Quick easy and far less hassle than a lot of other designs. And there you have it. The system is assembled and ready to be fired up for the first time. So what do we think of it here in Scan? It’s a bit of a niche item but it does the job very well if it fits your requirements. Annoyingly some mechanical parts are still required to complete the build but you can work around these as well. We’ve set ours up with an SSD for the O.S. drive which will keep the performance up and the noise down but you’ll still need something to hold your project data and a larger mechanical is still the only real option. For our demonstration unit we set it up using a caddie that allows you to fit both a laptop hard drive and a slimline slot loading Dvd drive. The laptop harddrives are generally quiet solutions and by using the caddie it allows the drive to be swappable allowing for quick backups or the moving of projects between machines. Also by using a slot loading optical drive in this solution we get a reduced noise level as slot loaders tend to pinch the optical disk on both sides rather than a single sided spindle lift you see in tray designs so less rattle from your dvd’s. On the all important performance side it work fantastically too. We initially tried it with a normal 95w 2600 CPU and ran it on Prime 95 for around 6 hours with the CPU running around the 85 degree mark. Whilst that is still within Intels limits we like to build our systems with a bit more overhead as studios as we all know tend to get a little bit toasty once all those lovely toys are turned on! So we broke out the 2600S low powered edition which uses around 30% less power than it’s bigger brother. We clocked up the CPU to around 3.3Ghz which is only just slightly slower than the 3.4Ghz rated 2600 regular and did the same Prime 95 test once more. This time we got an average of around 70 digress over the same time frame which is far below our own in house threshold and once you factor in that the machine will never be run in the real world at this sort of level for more than a few minutes at a time it promises a long and stable life for the machines usable duration… most impressive! Whilst you can never fully remove every mechanical component from your build, by using these options you will minimize the noise levels of what’s left and the result will be an extremely quiet solution ideal for in studio usage. This system is available on the Scan 3XS site on the audio system configurator : 3XS NF26 Silent P.C. QuNexus: Does the world need another small keyboard controller?